Attendance at WASH had been gradually dropping from the sell out days of the early and mid 90’s, the twentyfirst WASH actually had fewer people than the first, but we were there to celebrate the birthday, so ‘party’ was what we did. We were helped in a small way by Searles themselves, who had come up with a gimmick, presumably for the kids who come in the summer, of a cartoon type character who lived at the camp and drove the amphibious vehicles out into the sea… he even had a catchy little song released on CD that was played at least several times a night (and available at the shop for only £3.99) So the whole place rocked all weekend to the delightful strains of “Captain Willy and the Wash Monster” – fortunately Captain Willy didn’t seem to last to the next year ! 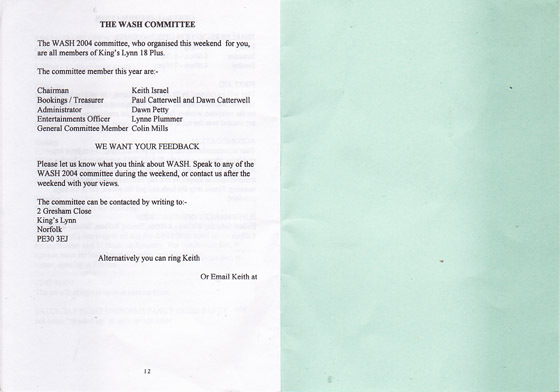 Things are happening as far as WASH 2004, the 21st Anniversary, is concerned The Committee had an evening by the seaside recently and were invited to Searles. It seemed very surreal seeing children, not to mention sober people wandering around the place (we were suitably disgusted)! However some of your treasured memories are all ready for you in ONLY 1 MONTH’S TIME. The ducks are still about and we are reliably informed by their military commander that they are ready to destroy the morning slumber of party-going Plussers. Pot Noodles and other culinary delicacies are awaiting purchase from the shop, and the aroma of the chip shop assailed (or is that assaulted) our senses. Just to let you know that although the deadline of the 25th is past DON’T STOP BOOKING. We have got a real roll on at the minute with lots of groups improving on last year by bringing members who have joined since coming to last year’s WASH, as well as friends who may join for next year. WASH stands for Weekend At Sunny Hunstanton. It is the biggest annual holiday weekend in 18 Plus & is run exclusively for 18 Plus by 18 Plus members from the Kings Lynn group. 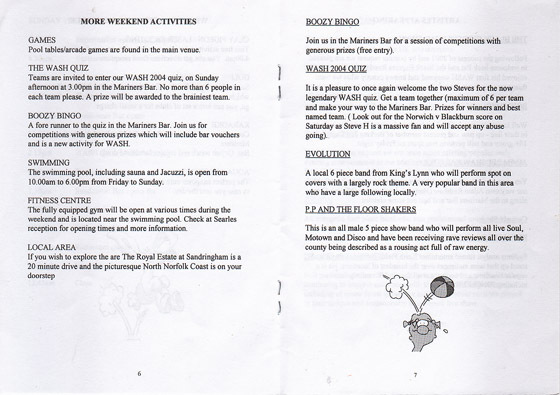 WASH 2004 is being held at Searles Holiday Park in Hunstanton, North Norfolk on 5th — 8th November 2004. Last year, almost 450 members of 18 Plus took part in the weekend from across the country. Only £55 for members and £63 for ‘friends’. This includes your accomodation in luxury caravans plus most daytime & evening activities and entertainment. The on-site facilities include a swimming pool, sauna, jacuzzi, gym, supermarket, chip shop & restaurant. You will need to pay for your own food & drink. A small charge may be levied for some of the daytime activities. How do I book a place for WASH 2004? 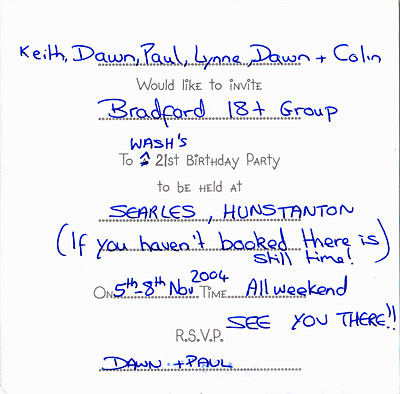 Your group will elect a Group Booking Agent, who will collect your deposit (£20) & pass this onto the WASH 2004 Bookings Officer to reserve your place. The balance will need to be received by WASH 2004 by 25th September 2004, so expect to pay your Booking Agent at least a week before this date. 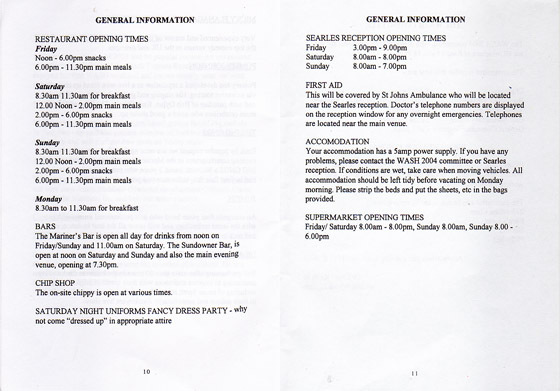 A couple of weeks before WASH, your Group Booking Agent will pass you a Booking-In Slip. Keep this safe & make sure you take this with your membership card or receipt to WASH.
What happens when I arrive at Searles on the 5th? The first thing you must do is book-in at the Searles reception. 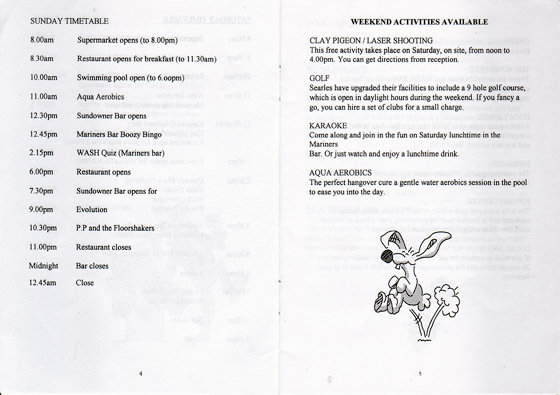 To do this you will need to hand over your WASH 2004 Booking Slip & show a valid membership card or receipt. What is a “valid” membership card? Please note only membership cards which do not expire until after 9th November 2004 are acceptable. If you have a membership receipt, these are only valid a month so, this must not have been issued prior to 9th October 2004. If you do not have a valid card/receipt or forget to bring it, you will be required to pay a levy equal to the current full membership fee. There are no exceptions to this rule. Under current Federation rules, you are able to claim a partial refund of this money from National after the weekend. What about a pass for the weekend? 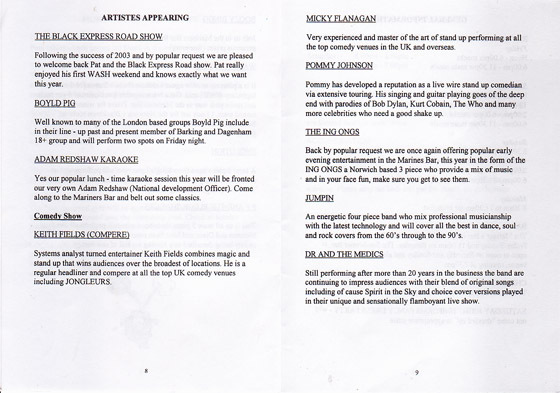 After booking-in, you will receive a programme with your name, group & caravan number on it. This is your pass for the weekend and must be shown to gain entry to the Clubhouse & the Princess Theatre. It must also be shown on demand to any member of the WASH 2004 Committee or the Searles security staff. 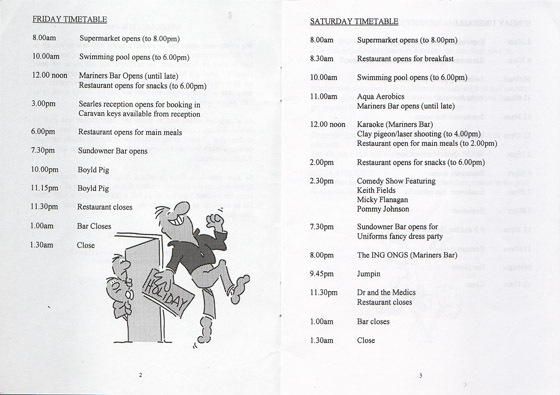 Your pass also gives details of the activities & entertainments taking place over the weekend. What happens at the end of the weekend? Please ensure your caravan is left tidy & clean, strip the linen off the beds & return the keys to Searles reception before you leave. Please speak to your Group Booking Agent. If they are unable to answer your question, please ring any member of the WASH 2004 Committee. Following various consultations and the success in membership recruitment terms of last year’s Bring A Friend incentive, and to ensure the financial existance of WASH we are offering non-members the chance to come to WASH. This is not an ongoing allowance, the fact is we need to have 350 people attending to ensure Searles continued support, once membership rises again we will reconsider.This is how it works. Who Can Make The Most Of This Opportunity? Every group knows people who have ‘nearly’ joined 18 Plus but for one reason or another have not, people such as brother, sisters or workmates. They may not be able or willing to commit to all that individual groups do but may be interested in attending a weekend event. How about ex-members who haven’t rejoined for similar reasons. Anyone who has not been a member of the Federation for at least the past 12 months. This will stop members from not bothering to renew their membership in order to attend WASH 2004.
Who Will Be Responsible For ‘Friends’? 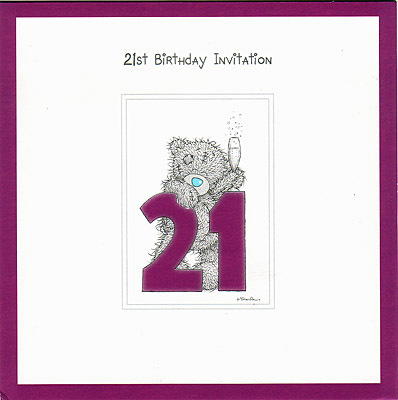 Every ‘friend’ who attends will need to be proposed by a group, who will be responsible for them. ‘Friends’ will be expected to observe booking conditions in the same way as members..
How Much Will They Be Charged? How Will It Benefit WASH 2004? 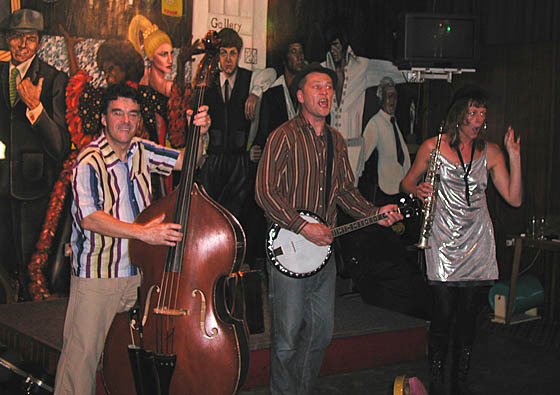 WASH has always been renowned for it’s friendly atmosphere, unlike nightclubs there is no trouble and people mix freely. More people will make the atmosphere even better so everybody will benefit. How Will It Benefit The Federation? When non-members or those whose memberships have lapsed see what a friendly, fun time being in 18 Plus is all about our hope is that a percentage of ‘friends’ will want to join. During early June the booking forms will be sent to group chairpersons and last year’s booking officers. 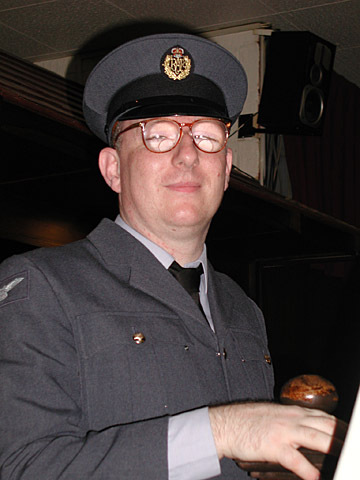 I would just like to thanks the entire WASH committee for putting on one of the best WASH events so far, the bands were excellent, the boozy bingo a great laugh, the Australian comedian was great, so was the legend of the quiz (although Norwich Supporters). Well done to Adam for the Karaoke, wish it ran on a little longer though, but maybe next year. I would like to thanks all of you that took the Mickey out of me, I shall get you all back one day. But I support that’s what being National Chairman is all about. Keith keep up the great work, and as I said you the members are the only ones that can keep WASH alive with the number near the 400 mark, go out and get more members. Again thanks guys and girls you were all great. Hope you are all feeling as rough as I am! Just to say a huge ‘Thank You’ to all 378 who came. Hope you will agree with us that this year was something special. We had 5 acts who we would happily re-book again at sometime in the future. The quiz was great as usual and well done to the WASH W***kers who were magnificent in third place. The half board is well attended and was blooming nice, fancy dress seemed to go down a storm, the atmosphere was lovely and I even took part in bingo for the first time in my life (I think having the word ‘booooozy’ tempted me a little bit)! 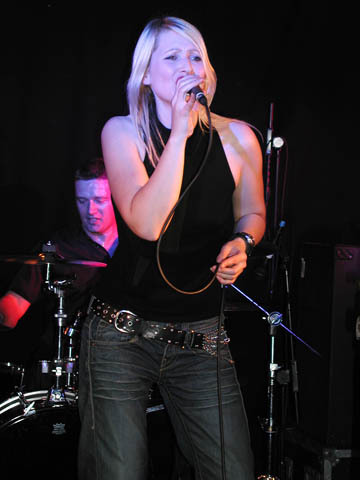 One of the biggest compliments to you all was paid by the lead singer of Evolution. He said that the last couple of gigs he did were ruined by fighting. He could not believe that 400 people can get on so well and have such a brill time, so THANK YOU. We are working on plans for this year already. We had a meeting with Searles when we handed them a rather large cheque and they were well happy with us. They really love having us and look forward to our return in 2005. 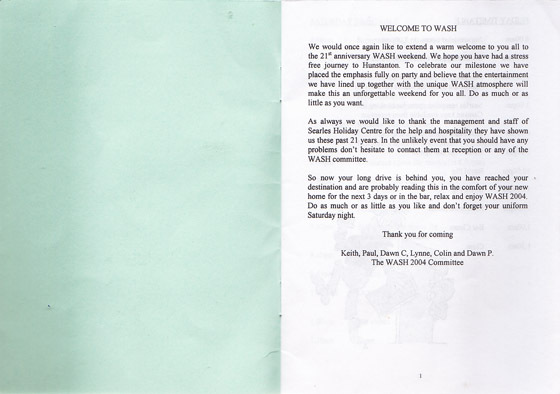 THE DATE FOR WASH 2005 is 4TH – 7TH NOVEMBER. Just thought I’d take the time to join the queue to offer my hearty congratulations to the WASH crew for a superb weekend of entertainment, fun, smiles – OK, and a few drinkies! After the events of a couple of years ago (naming no Eurovision Song Contest winners! 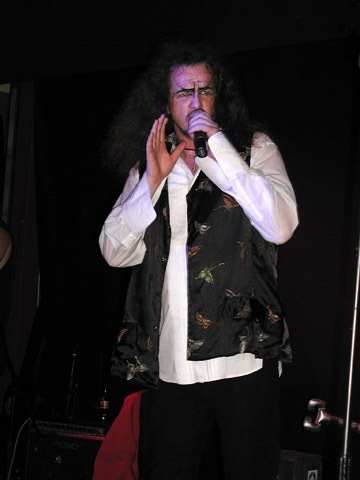 ), it was a delight to be able to listen to six top-notch groups, including the amazing Doctor and the Medics – top act, just what WASH needed. 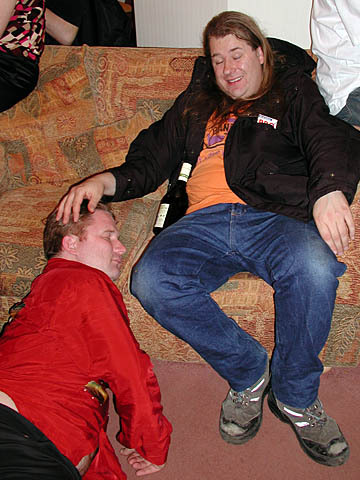 All in all, everyone had a blast (except for one misery who seemed to spend the whole time stood near the bar – not drinking, mind) – shame on you and a plague of head lice, WASH is about FUN, not skulking about. To all those who commented on my American Football Ref’s uniform, many thanks, it was much appreciated, although others (like Christian Hayter) were spectacular. You know what, I can’t wait for next year! even with Iain’s pocketful of Pro-Plus ! There was one thing that had all the guys (and some of the girls) drooling at Searles this year… Jonathan’s Lambourghini. DON’T PUT DIESEL IN A LAMBO’S PETROL TANK !